As I posted a few months ago, the Laura F. Willes Center for Book of Mormon Studies and the Foundation for Ancient Research and Mormon Studies (FARMS), in conjunction with Religious Education and the Harold B. Lee library, presented a weekly lecture series during the Winter Semester 2010 in honor of the 100th anniversary of Hugh Nibley’s birth, who was born on March 27, 1910. The lecture series concluded on April 8th. I was able to attend some of the presentations, and they were very well done. I’m grateful to be able to get to know better the man, scholar, and saint, Hugh Nibley, and what he taught. The Neal A. Maxwell Institute has reported that video of the lecture series presentations will be made available soon, likely on the Neal A. Maxwell website. 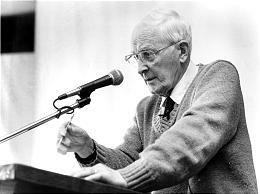 The Institute also reports that an updated bibliography of Hugh Nibley’s works has been made available. An article by Hugh Nibley has also been made available that has not been published in The Collected Works called “Beyond Politics.” The talk was given on October 26, 1973 to the Pi Sigma Alpha honor society in the Political Science Department at BYU. It first appeared in BYU Studies 15/1 (1974): 3–28; and was reprinted in Nibley on the Timely and the Timeless. I’m still curious if these articles available here are still unpublished elsewhere in The Collected Works. If anyone knows, I’d be interested to find out if they have been published or will be published. Video of the lecture series is now available at The Neal A. Maxwell Institute website.